Top 10 Royal Caribbean Deals Not To Miss! Wherever your heart desires, chances are Royal Caribbean cruises there, with 22 ships visiting every corner of the world, the possibilities are endless. Here are the top 10 Royal Caribbean deals that you won’t want to miss. 1. Alaska cruise deals from Royal Caribbean include the 7-night excursion from Vancouver to Seward which departs on May 17, 2013. Starting at only $624pp, this cruise offers cruising through the Inside Passage, Icy Strait and the Hubbard Glacier as well as stops in Ketchikan, Juneau and Skagway. 2. Mediterranean cruise deals include the October 7th, 2012 sailing roundtrip from Rome (Civitavecchia) where for 7 nights aboard the Navigator of the Seas, you visit such places as Messina, Turkey, Athens and Crete. Prices start at just $399pp. 3. Royal Caribbean deals roundtrip from Barcelona, Spain can be had on the October 20th, 2012 sailing with prices starting at only $619pp. Stops in Toulon and Nice, France, and Florence (Livorno), Rome and Naples before heading back to Spain. 4. European cruise deals like the one that departs from Copenhagen, Denmark on August 31, 2013 take you to such destinations as Estonia, St. Petersburg, Helsinki and Stockholm on a 7 night sailing with prices starting from $799pp. 5. A different part of Europe can be seen on the 3 night sailing from London (Southampton) on October 23, 2013. From just $296pp, this cruise visits both Brussels and Paris before heading home. 6. Royal Caribbean deals in Europe are also available on the 10 night cruise on the Vision of the Seas departing Copenhagen on August 7, 2013. From just $1,099pp, this cruise takes you to Dover, Cork, Ireland, Dublin, Glasgow and Loch Ness before returning to Denmark. 7. Royal Caribbean’s Dubai cruises allow you to explore the UAE in a whole new way. From just $629pp, the 7-night cruise roundtrip from Dubai that departs on January 28th, 2013 takes you to Fujairah, Muscat and Abu Dhabi before a day in Dubai to finish the trip. 8. Other Royal Caribbean deals include the lovely fall splendour cruise aboard the Jewel of the Seas on October 21, 2012. Cruise from Boston for 7 nights starting at just $489pp and discover Halifax, Saint John, Bar Harbor and Portland before returning. 9. If the Bahamas are calling, Royal Caribbean has you covered. Their 4 night cruise departing Miami on November 19, 2012 takes you to Nassau, Cococay and Key West from just $329pp. 10. Royal Caribbean’s newest ship, the Allure of the Seas takes you to the Caribbean roundtrip from Ft. Lauderdale. From just $828pp. on the September 23, 2012 sailing. Stops include Haiti, Jamaica and Cozumel Mexico all on the newest most ingenious ship sailing today. 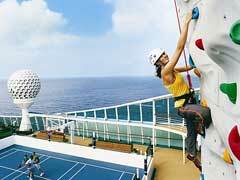 Whichever deal you choose, you are sure to have an amazing adventure when you choose Royal Caribbean cruises.